Journal of the Islamic Medical Association of North America, March, 2010: “A true scientist, ibn al-Haytham pioneered scientific inquiry, experimentation, debate, and discussion. He emphasized that valid experimentation was necessary before any authentic conclusions could be reached. Bradley Steffens in his recent biography of this great Muslim scientist gives him the credit of being the first true scientist of the human civilization. He states that ibn al-Haytham practiced and exemplified these ideals during his tumultuous life. That ibn al-Haytham was generations ahead of his time is evident when you read this lucid and fascinating biography. Steffens has a unique ability of a storyteller that makes the reading of his book as interesting as a spy thriller, unfolding the events in ibn al-Haytham’s life like the clues being discovered by a forensic detective. I was so fascinated by this rendition that I have yet to read a biography in a shorter time in my life. I finished the book from cover to cover in just under four hours! This book is a must read for anyone who wishes to learn about a forgotten chapter in history and enjoys the true spirit of inquiry and is an eternal seeker of truth. —Dr. Husain F. Nagamia. Read the complete review here. The Fountain, May-June, 2008: I congratulate Bradley Steffens for his beautiful work about Ibn al-Haytham and his advancement of experimental science. —Dr. Ertan Salik Read the complete review here. Kirkus Reviews, December 1, 2006: In this clearly written, carefully reasoned profile, Steffens not only traces the scantly documented life of one of early modern science’s giants (better known in Europe as Alhazen), but also places him both within the broader contexts of early Muslim society, and of the whole history of science. A prolific writer who spent most of his life in Basra and Cairo, Ibn al Haytham is chiefly remembered today for his work in optics, and as an exponent of enquiry through direct, repeatable experimentation rather than inductive reasoning alone. Along with easy-to-understand discussions of his achievements, readers will find a speculative but credible character study of a devout, brilliant polymath who was rather conveniently subject to mysterious bouts of mental illness that twice rescued him from onerous government jobs. The many color pictures enhance this illuminating narrative with maps, diagrams, prints, and images of illustrated manuscript pages. Midwest Book Review, March 6, 2007: An unusual survey of a scientific pioneer who lived from 950 to 1040 and whose work fostered several scientific and mathematical fields from physics to astronomy and geometry. Chapters consider his life, achievements, and experimental processes in this fine blend of history and science biography. Skulls in the Stars, March 2008: Steffens has written a wonderfully clear and concise account of al-Haytham’s life and work. Although the book is primarily intended for a young adult audience (hence the conciseness), it also serves as a nice stepping stone for authors (such as me) who would like an overview of his accomplishments before delving into the academic accounts. The quality of the book is excellent. It is wonderfully typeset and contains many full-color illustrations that bring the era and the science to life. It is also contains an excellent collection of references for further research. Read the complete review here. 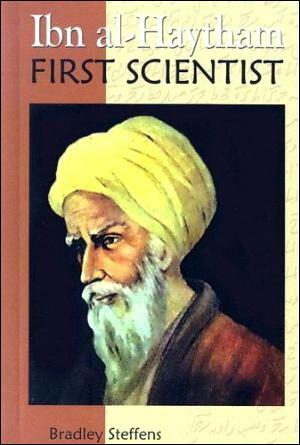 To read a sample chapter of Ibn al-Haytham: First Scientist click here.